Perhaps not a cut above previous productions neither was it a close shave. This summer’s Merola Opera production of “The Barber of Seville” had much to recommend it—mostly the voices of the promising young singers-in-training. The only truly false notes were struck by the set, a cheap glitzy affair designed by Erik Flatmo (who should know better), dominated by tinsel strands that made it look alternately like a Christmas tree and the decorations at a high school prom; some unflattering costumes, particularly for the heroine, by Kristi Johnson; and a series of fright wigs, as well as overly-slapstick and sometimes klutzy direction by Roy Rallo. But the music was fine, beginning with an exceptionally nuanced performance of the famed overture, under the direction of Mark Morash. 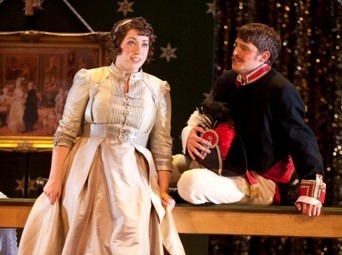 Daniel Curran was an ardent Count Almaviva, if sometimes missing the niceties of bel canto phrasing in his arias. Where he really came into his own was when he put on the disguises of first a drunken soldier and then a doddering music teacher in order to woo his lady love. Curran was really, really funny in disguise. The lady in question, the lovely Rosina, who is being kept a virtual prisoner by her guardian (who hopes to wed her himself), was well sung by Renée Rapier. As previously noted, she would have benefited from a better costume, but her voice was lovely and her opening “Una voce poco fa” a comedic tour de force. John Maynard and Peixin Chen were a fine pair of old fools as Dr. Bartolo, the guardian, and his crony, Don Basilio, Rosina’s music teacher. If I had to put money on who in this cast would be the next breakout star to come from the Merola program, the San Francisco Opera offshoot that has spawned such singing superstars as Thomas Hampson and Susan Graham, I’d bet on Chen, as fine a basso as I have heard. Don Basilio is a small part and this guy deserves a bigger vehicle for his talent (perhaps “Boris Godunov”)? Odds are he’ll get it, too. Marina Boudart Harris had a nice second-act moment as the disgruntled maid, Berta, although why the director chose to have her sneeze her way through Act One is beyond my ken. But the name of this show—and its star—is the “Barber,” and Merola had a fine Figaro in Mark Diamond. Not only did the baritone negotiate the intricacies of “Largo al factotum,” the undeniable showpiece of this opera (as I was exiting a nearby restaurant earlier that evening, the waiter asked if we were going somewhere after dinner and, when I told him, he treated us to a few bars of “Figaro, Figaro, Figaro”), but Diamond was funny and cool with a nice stage presence. Another up-and-comer. The opera was double-cast, as befits a program that nurtures the voice: singers typically should not be called upon to perform their roles two days in a row. No doubt the other cast had its merits as well. But, from where I was sitting, the future of opera seems to be in very good hands indeed.